The Florida postal carrier who flew a gyrocopter onto the grounds of the US Capitol faces up to nine and a half years in prison. Charges listed in the indictment against Douglas Hughes, 61, of Ruskin, Florida, include violation of registration requirements for aircraft, violation of national defense airspace, and operating a fake postal vehicle. The US Postal Service logo on the gyrocopter Hughes flew apparently prompted the last charge. The Florida postal carrier’s arraignment is scheduled for Thursday. Hughes told a local TV station, on a stop in Savannah, Georgia on his way back to Washington, that he planned the gyrocopter stunt to bring attention to campaign finance corruption in US politics. "To be perfectly clear, I'll never do that again, but yeah I think it was worth it,” WTOC-TV reported Hughes as saying. “I think that we are seeing the momentum build for reform, and I think that the groups that have been working on this are going to be able to be able to put it over the top in the next few years." 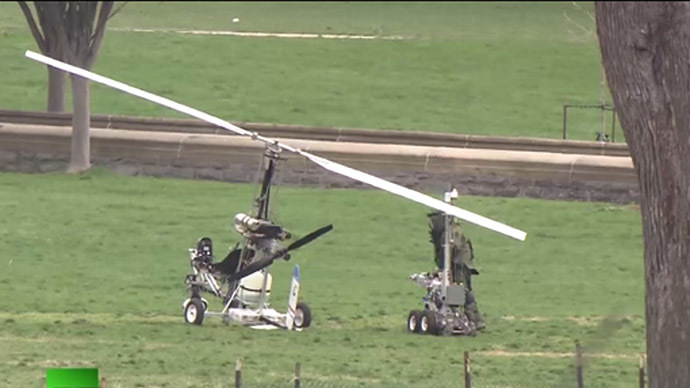 The gyrocopter contained a sack of 535 letters regarding the Supreme Court's 2010 decision in Citizens United vs. Federal Election Commission. Each letter was addressed to a member of Congress. Given the high density of government buildings, much of Washington, DC’s airspace, including that over the White House and Capitol, is restricted. The only non-governmental flights permitted in the restricted zone are commercial flights scheduled to take off and land at a nearby Virginia airport, according to the FAA. The postal carrier “literally flew in under the radar,” according to Homeland Security Secretary Jeh Johnson.